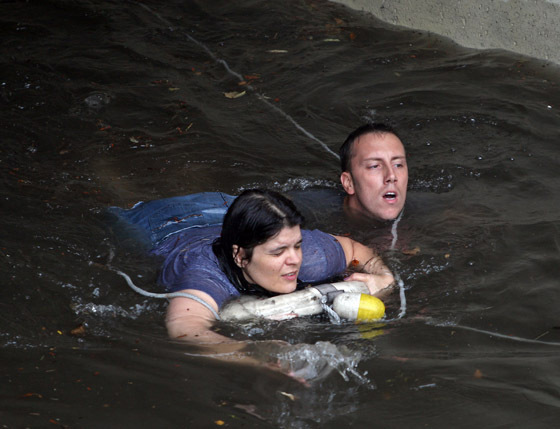 8 years ago today, a unique water rescue for Somerville firefighter Mike Marino & Mass State Police. 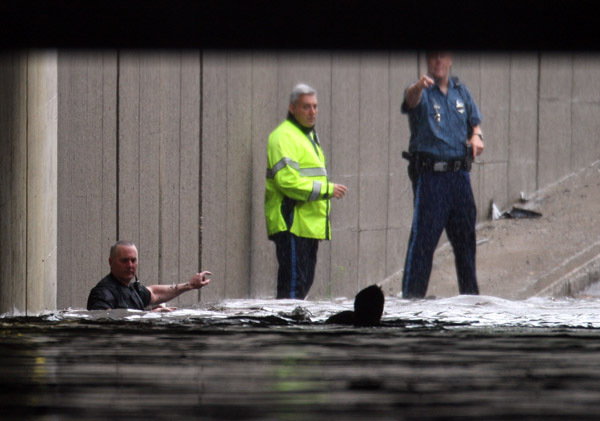 It was 8 years ago today that Christine Desrochers-Broderick, clinging to the roof of her submerged car, was rescued by off-duty Somerville firefighter Michael Marino in the Assembly Square underpass at Mystic Ave. It was not long after that all three of us were contacted by The Weather Channel, to “star” in their (then) new show, Twist of Fate. Here is my blog dispatch from that day. I came upon this dramatic scene after completing news coverage of a long, hot, then very rainy immigration rally in Boston for the Boston Herald. The police scanner was crackling something about a person or persons stuck under the Assembly Square underpass at Mystic Ave. I drove to an area near the courthouse where I saw troopers feverishly trying to enter the water and gain access to the serious situation that was unfolding. I noticed a young couple sitting on the curb and I turned to see that their car’s roof, about an inch of it, was still visible. Within a few minutes the tunnel was almost 80% filled with water maybe 10 feet high. I had to kneel down to see what was unfolding about 70 yards into the tunnel. There I could see a woman atop of what appeared to be her car. I returned to my car to get my 800mm telephoto lens, snapped a few photos there and then ran like hell to the other side of the underpass. That is where I saw troopers Joe Kalil and Stephen Barnes and Somerville firefighters Jack Betkwith, LT Michael Anzalone and off-duty firefighter Michael Marino. I positioned myself on McGrath Highway above the rescue and pointed my 70-200 mm lens through the chain link fence. The troopers and the firefighters worked in unison to perfection. The only problem was, would my lens stay dry enough in the rain to capture the rescue? I borrowed the corner of a passerby’s dry shirt to use to clean my lens since my clothes were drenched. Lucky for me that the man didn’t think I was nuts when I asked him: “may I use your shirt to clean my lens?” Then, out the rescuers popped with one cold and wet Christine Broderick, as they guided her through the water that now contained mostly raw sewage. Please see some of my scene photos below and my Herald photo gallery can be seen here and O’Ryan Johnson’s story here. 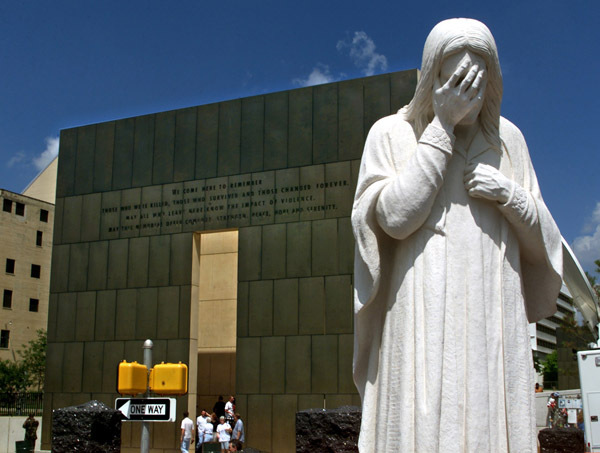 23 Years ago today, the Oklahoma City Bombing: My experiences and photographs. In 1997 I was sent with Boston Herald columnist Peter Gelzinis to cover the 2nd anniversary of the bombing of the Alfred P. Murrah Federal building. In 2001 we returned to the bombing site to provide coverage of the moment that Oklahoma City bomber/murderer Timothy McVeigh was executed (in Indiana). While we were there, on both trips, Peter introduced the Denny family to our readers and to me. Peter had met the Dennys only hours after the actual bombing when he and Herald photographer Matthew West were dispatched to the horrific scene. In 1995 Rebecca Denny, then age 2 years, and her 3 year old brother Brandon Denny, were severely injured in the explosion while they were attending the building’s day care center. On June 11, 2001, the day that Timothy McVeigh was executed in Terre Haute Indiana, many victims and relatives, including the Dennys, marked this moment by returning to the now beautiful grounds and memorial of the Murrah federal building’s footprint. 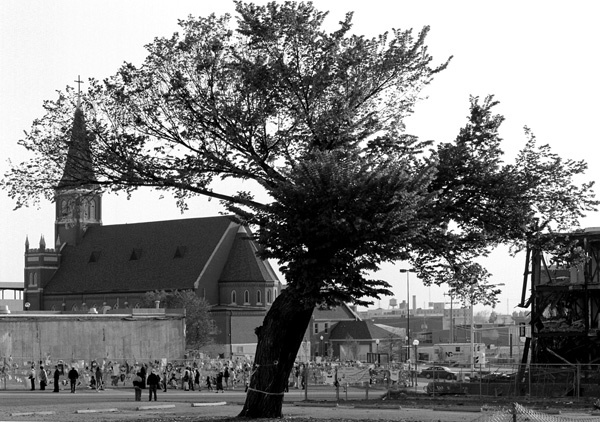 Here, beginning with a 1997 black & white photo of The Survivor Tree, are some of my photos from my two memorable trips. On a personal note, it is heartening to see that from senseless tragedy, good and decent people rise from the ashes and quickly turn the narrative positive. Also, I feel blessed to have met the Denny family. 1997 photo of Rebecca Denny, then age 4 years, and me, as Peter Gelzinis, off camera, interviews Rebecca’s brother Brandon, at their Oklahoma home. 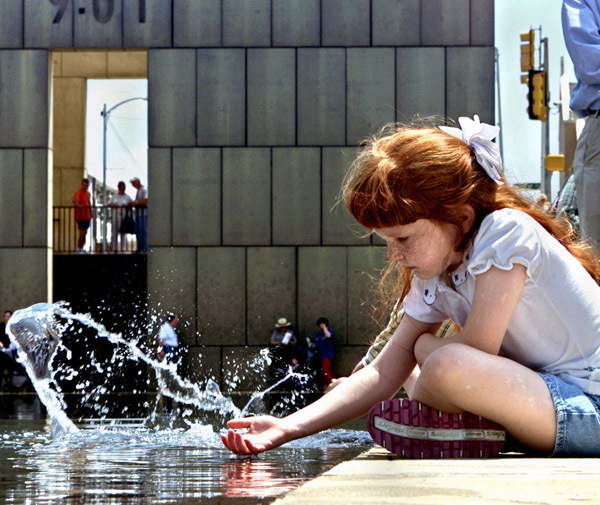 Rebecca Denny, age 8 years, is seen at the Oklahoma City National Memorial, moments before the execution, in Indiana, of Timothy McVeigh. 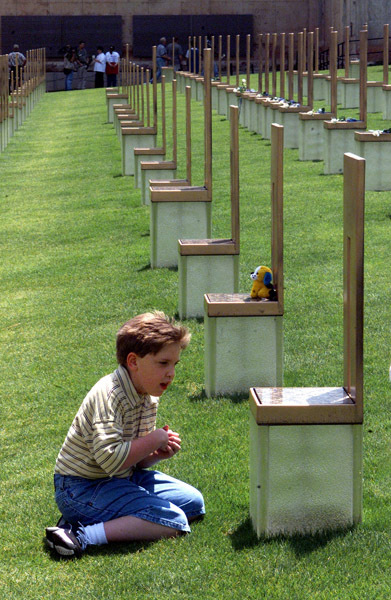 Brandon Denny, age 9 years, also known a “Miracle Boy” due to his improbable survival living against all odds after having a hole the size of a fist punched thru his brain in the Murrah Federal Bldg bombing, prays at a chair that symbolizes his dead friend Chase Smith who was in the same day care in the bldg but did not survive. 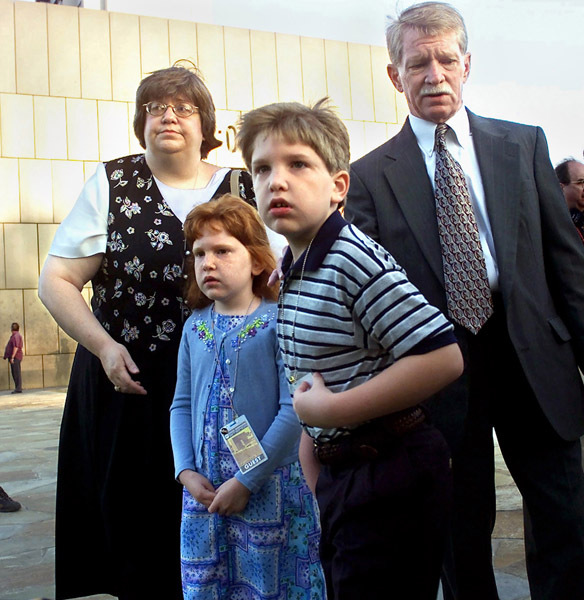 The Denny family, moments before the McVeigh execution. 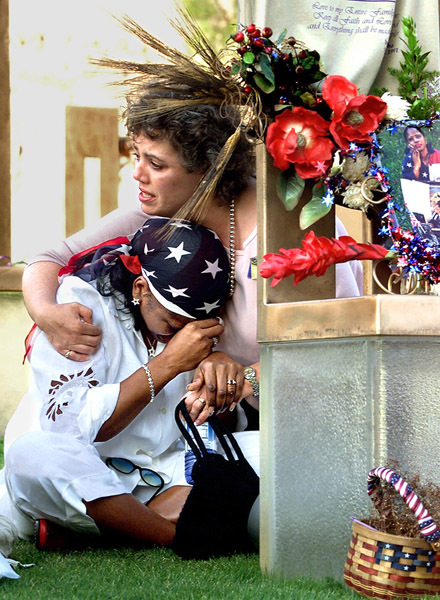 Seconds before the execution of Timothy McVeigh, Deb Ferrell-Lynn, who lost her cousin Susan ferrell, hugs Constance Favorite, who lost her daughter LaKesha Levy. 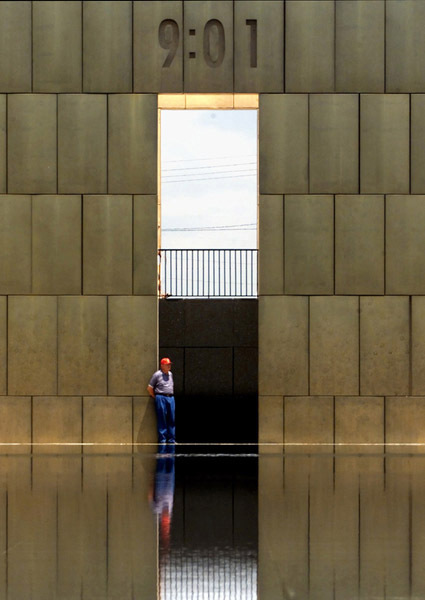 Posted in Uncategorized | Comments Off on 23 Years ago today, the Oklahoma City Bombing: My experiences and photographs. More from Saturday’s big Revere fire. Per reader requests. 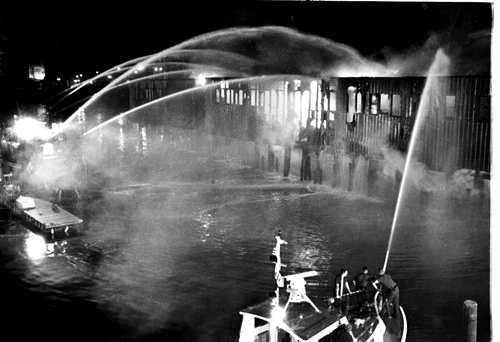 My Boston Herald photo coverage of Saturday’s 5-alarm fire in Revere caught the attention of several readers of my blog, and of the Herald. Here is most of my photo shoot from Saturday evening’s fire at Sozio Appliance, a fixture on Squire road for many decades. Here is the Herald story from Kathleen McKiernan, and, as always, reader feedback is very much appreciated..
Posted in Uncategorized | Comments Off on More from Saturday’s big Revere fire. Per reader requests. 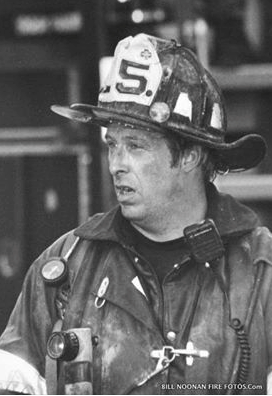 Boston fire Lt. Steven Minehan died 23 years ago today. 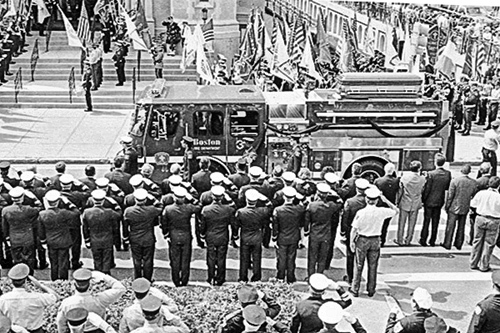 On June 24, 1994 Boston fire Lieutenant Steven F. Minehan, of Boylston street’s Ladder 15, died in a 9-alarm fire in Charlestown after he became trapped in a large warehouse while searching for other firefighters who had become trapped. 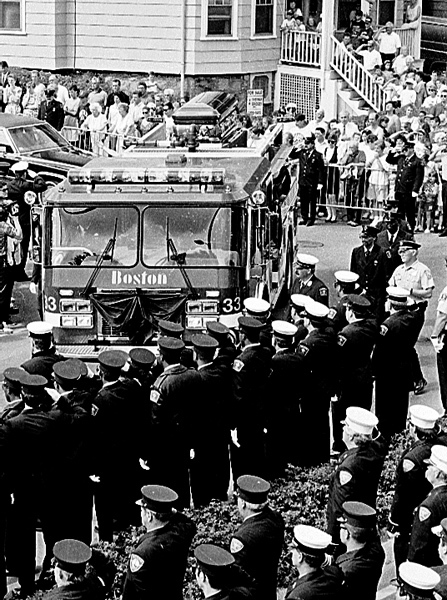 I had been a staff photographer at the Boston Herald for almost 15 months that night when, police/fire radio scanners broke the silence of what had been a quiet evening. John Landers Jr., then Herald night desk photo editor, and I heard the initial call for help from Minehan as he dispatched me to the scene. Below are my photos from that night and from Lt. Minehan’s funeral. Over the years I have been lucky to be able to call Lt. Minehan’s wife Kathy a friend. She is a very kind and considerate soul. RIP Lt. Minehan. My photos from that night are seen below. The photo of Lt. Minehan, at bottom of page, is courtesy of Bill Noonan. 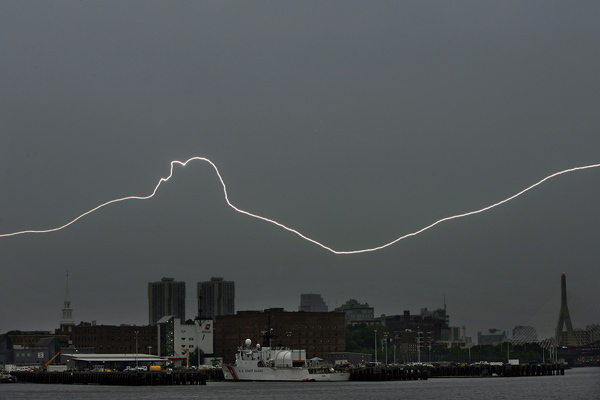 I photographed several Boston storms that day, 6 years ago. I did not go out to the hard hit areas of western Massachusetts, but I did see some tremendous lightning in and around Boston. 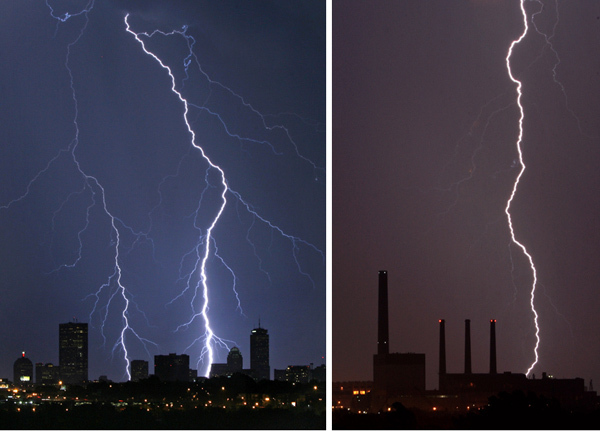 The top two photos were snapped between 9-10pm from Medford. The bottom photo was snapped in the mid-afternoon from East Boston. The Coast Guard station lightning bolt looks totally fake, or “photoshopped.” Lucky for me, I had another camera rolling video (at bottom) of the same strike. Neil Fingleton, “Game of Thrones” actor and one of the tallest people in the world at 7 feet 7 inches, died yesterday at the age of 36, reportedly of a heart attack. See Worcester Telegram story here. In 1999, I spent several weeks with Neil as he completed his senior season on Worcester’s Holy Name High School basketball team. I had heard about Neil and wanted to do a picture story/photo essay about him for the Boston Herald. I took my idea and petitioned his coach, Worcester sport’s legend J.P. Ricciardi, who later became a Major League Baseball executive. I met with Coach Ricciardi at a coffee shop in Worcester. He made it clear that he did not want Neil’s height to be exploited. I was given a thumbs up to meet Neil and to get his blessing on the project. He was all in. Neil was a bit shy at first, but we quickly took a liking to each other. The last time I spoke to him, he had called me at the Herald in 2007 or 2008 and alerted me to his new career in the entertainment business. He said he was traveling to Boston to promote a show he was in, and asked if I wanted to cover the event for the Herald. We never connected. Below are my photographs from my time with Neil. May he rest in peace. Two years ago 18 year old Neil Fingleton traveled to Worcester,MA. from his home in Durham, England to learn a game he had never played. In several days he will have come full circle when he announces his decision to accept a full Basketball scholarship to the University of North Carolina. Legendary Worcester area athlete and former Celt’s player Togo Palazzi works with Neil. Togo says about the “work in progress”, “it’s a labor of love” (working with Neil) . “Doin’ Steps” is the term affectionately known for the exercise that was developed by school strength coach Tony Elia. In his room which has a taste of home Union Jack flag on the wall, hours after deciding on a full scholarship to University of North Carolina, Neil receives congratulations from a friend. Hours before choosing UNC over Wake Forest, Neil consults with Asst. Holy Name hoop coach Tom Clark (Left) and head coach J.P Ricciardi. Long hours at the gym have paid off for Neil as he dunks during practice. Going thru the workout developed by Holy Name strength coach Tony Elia, teammates of Neil’s come up short during a flexibility drill. Neil Fingleton going thru the training paces with fellow teammate A.J. at Holy Name High in Worcester. Neil relaxes with friends in the Holy Name Cafeteria hours before the first game of the season. Before his 1st game of the Holy Name High School schedule, Neil gathers his thoughts alone in the locker room. 1st game of the year vs Worcester South. Neil leaves school the day after making his choice to accept a full scholarship at University of North Carolina. My fire & ice photos: Boston firefighters work yesterday’s six-alarm fire in Charlestown. 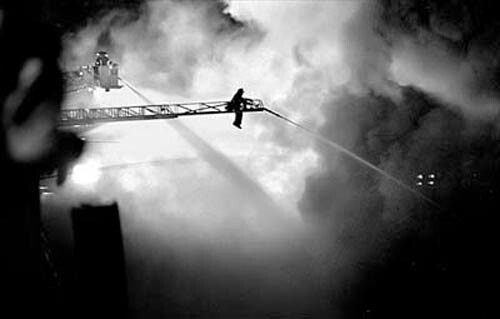 Frigid temperatures and a dangerous windchill hampered Boston firefighters yesterday at the scene of a 6-alarm fire. The building housed 11 residents and a laundromat, which was featured in the Ben Affleck movie, “The Town. 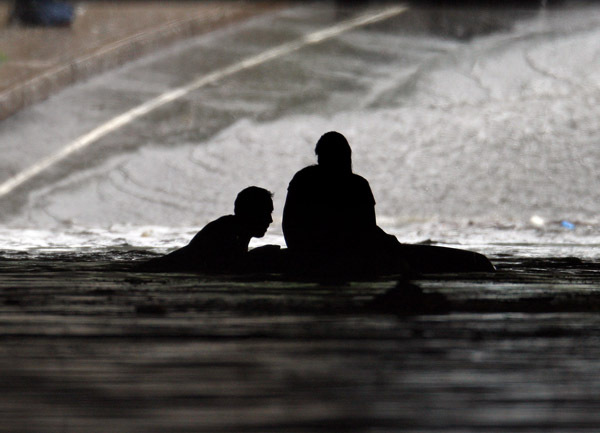 My photos were part of my coverage as a staff news photographer at the Boston Herald. Also, two Go-Fund-Me webpages have been established —-> here & here.